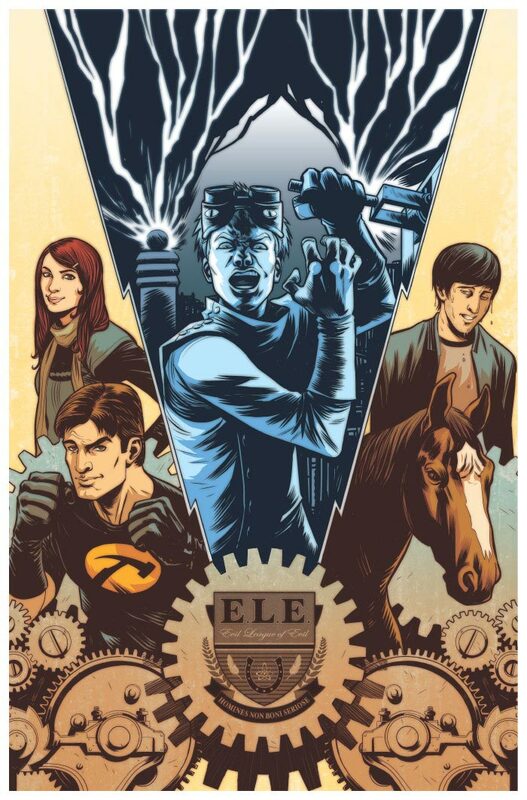 September sees the release of Dark Horse’s "Dr. Horrible" trade paperback collecting all of the comics based on the Whedon family musical. Written by Zack Whedon with art by Joëlle Jones, Jim Rugg, Farel Dalrymple and Eric Canete, this edition includes the "Dr. Horrible" one-shot, three strips originally published on "MySpace Dark Horse Presents" and an all-new story starring the Evil League of Evil. CBR News spoke with Zack Whedon about Dr. Horrible’s evil friends, his evil fans and the evil plans for the "Sing-a-long Blog" sequel. Concocted during the Writers Guild of America strike of 2007-08, "Dollhouse" and "Buffy the Vampire Slayer" creator Joss Whedon’s "Dr. Horrible’s Sing-a-long Blog" was a pioneer of internet-distributed original short films by established creators. Starring Neil Patrick Harris, "Serenity’s" Nathan Fillion and Felicia Day, who would go on to create the popular web serial "The Guild," the three-act superhero musical found the titular villain, played by Harris, scheming to win love and destroy his nemesis. "Dr. Horrible" also happened to be a family affair, with brothers Jed and Zack Whedon co-writing the production, along with actress Maurissa Tancharoen. Zack Whedon, who has also written for television series "Deadwood" and "Fringe," went on to spotlight Dr. Horrible’s sidekick Moist and the nominally heroic Captain Hammer in short comics for "MySpace Dark Horse Presents" before returning to the man himself in a full-length "Dr. Horrible" one-shot. Regarding the book’s new story, which features Bad Horse’s Evil League of Evil, the prestigious and villainous organization which Dr. Horrible aspired to join, Whedon told CBR, "It is not an origin story. It is simply a night in the evil life of the ELE. They get up to all manner of evil. They don’t have much of a plan but are sort of evil-winging it and everyone gets in on the evil action." He added that Bad Horse, the evilest member of the League who has yet only been seen as the shadowy mastermind behind the curtain (and who is, in fact, a horse), will feature in the new tale. "Bad Horse is certainly present, and you get to see a bit more of how he interacts with his underlings," Whedon said. "It remains a mystery what exactly is so evil about him and why he is feared and revered as he is. Also left unanswered is how he opens doors." There is one notable villain, however, who will not be present. "Dr. Horrible does not appear in this one, which I didn’t think about until just now," Whedon said. "Perhaps he should have since the name of the collection is ’Dr. Horrible.’ Whoops. This takes place before he is admitted into the League." The artist on the story is Scott Hepburn, who Whedon said has done "a magnificent job bringing the League to life in this story. He has a very dramatic style which works well with how over the top evil these characters are. He can also make things scary, but not so scary that they are no longer funny. He does funny well. And Bad Horse looks awesome !" In addition to the new story, of course, the trade also provides the benefit of collecting all of the existing "Dr. Horrible’ comics into one place, without having to search the "MySpace Dark Horse Presents" archives then paging through the one-shot in print. "I hope it will be welcomed by fans. If not, we’re screwed," Whedon said of the edition. "It’s a nice bunch of stories that explore some corners of this world that didn’t make it into the show. If you like ’Dr. Horrible,’ I think it will be fun to have this companion piece. If you hate ’Dr. Horrible,’ this collection is a must have. Seriously. You should definitely buy it if you hate ’Dr. Horrible’ or are not aware of ’Dr. Horrible’ or are aware of it but completely indifferent or if you love ’Dr. Horrible.’"
As to how the various comics might play in to an eventual "Dr. Horrible’s Sing-a-long Blog" sequel, which Whedon has previously acknowledged he and his brothers are keen to do, the writer said, "They won’t, really, since they all take place prior to the show. There is a certain organization introduced in the ELE comic that will play a role in the sequel, if and when we get that off the ground. "Speaking of the sequel, we are all anxious to work on it, but some of us - and I’m not pointing any fingers here - but some of us have tentatively agreed to helm an all-star mega-blockbuster summer tent-pole extravaganza movie to be released in 2012," Whedon said, presumably referring to "Avengers," which Joss Whedon has long been rumored (but has yet not been officially confirmed) to be directing. "That could possibly, maybe, interfere with the production of our internet musical. Hopefully we will have time for all of us to do everything we want to do. "Those of us who aren’t helming ASMBSTPEMs are writing TV shows, so everyone is very happily busy at the moment. I’m hoping that when my TV duties are done for the season I can sit down with the gang and we can get this thing going. We want to do it badly." Tune in to CBR tomorrow as Whedon returns to reveal his next comic book project for Dark Horse.